EUROPEAN UNION LEADERS are to gather in Brussels for an extraordinary two-day summit from today, aimed at agreeing the bloc’s contested trillion-euro budget for 2014-2020. The budget comprises three main parts – the Common Agricultural Policy which covers farm aid, Cohesion Funds which help poorer member states catch up with their peers, and programmes to boost innovation and jobs. The talks promise to be tough as the 27 member states fight it out after a bad-tempered November summit failed to agree on compromise proposals submitted by European President Herman Van Rompuy. Van Rompuy put forward a budget of €973 billion, compared with the five per cent increase to the 1.04 trillion euros submitted by the European Commission. Britain led calls for even sharper reductions, to less than €900 billion, arguing that the EU could not expect an increase in spending at a time of austerity for national governments. EU leaders have said that the talks today and tomorrow are likely to prove very difficult again but analysts expect an accord, warning that another delay could be a serious blow to confidence. The seven-year budget, known as the ‘Multiannual Financial Framework’ (MFF), sets spending priorities over the period after the bloc’s leaders negotiate national contributions and ceilings for each of the five broad categories of expenditure. The European Commission plan allocates €339 billion to Cohesion Funds which help newer members invest in the social and economic infrastructure needed to help them catch up with their EU partners. 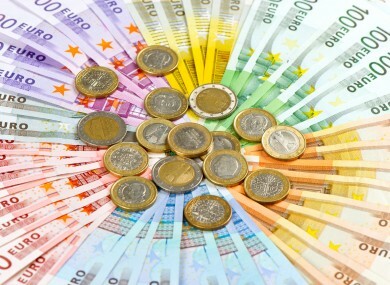 Another €164 billion goes to promote economic growth and job creation. Combined, this spending accounts for some 48 per cent of the budget. The second largest spending component of the budget is put at some €390 billion, of which €290 billion is for the Common Agricultural Policy which supports farmers. The balance covers rural development, fisheries and environmental protection. Some €72 billion is set aside for humanitarian aid, promoting human rights, development and regional neighbourhood policies. More than €63 billion is set aside to cover EU administrative costs. Contributions from each of the 27 member states based on their Gross National Income (GNI). This is the largest source, accounting for 68 per cent of revenue. Customs duties on imports from outside the EU, alongside a sugar levy, accounting for 12.9 per cent of revenue. EU governments keep 25 per cent of the monies raised to cover the cost of collection. A levy on the VAT base of each member state, capped at 50 per cent of their GNI. This accounts for 11.4 per cent of all revenue. Cash left over from previous years and fines for breaching EU rules and regulations make up the rest of the EU’s resources. The budget works out at €0.64 per day for each of the bloc’s 500 million citizens. Talk of an EU tax has been aired but never approved. Proposals on increasing the EU’s own resources are not aimed at increasing the budget but rather at reducing contributions by member states. Email “What's on the table for the 2014-2020 EU budget?”. Feedback on “What's on the table for the 2014-2020 EU budget?”.